The venture expects to pump 240,000 barrels a day after spending $8.3 billion to develop the Junin 5 block, Ramirez said. First oil will be pumped in 2013, Eni said today on its Web site. It will reach full production in 2016, Scaroni said. Eni SpA (ENI), Italy’s largest oil company, said its joint venture with Petroleos de Venezuela SA has started producing oil from the Junin-5 block, advancing Venzeula’s plans to develop the world’s largest reserves. Production from the block in the Orinoco Belt will reach 15,000 barrels a day by the end of the year and 75,000 barrels in 2015, the Rome-based company said in a statement today. The company had previously estimated it would reach 75,000 barrels of output from Junin-5 this year. I have a lot of fun around here with PDVSA, but if the Eni venture is on target, that makes the current meetings between PDVSA and Eni actually vaguely interesting. This entry was posted in Uncategorized and tagged eni, good news, italy, pdvsa, venezuela on November 22, 2013 by Steven Bodzin. US$1,000 is easy to carry around in your pocket. 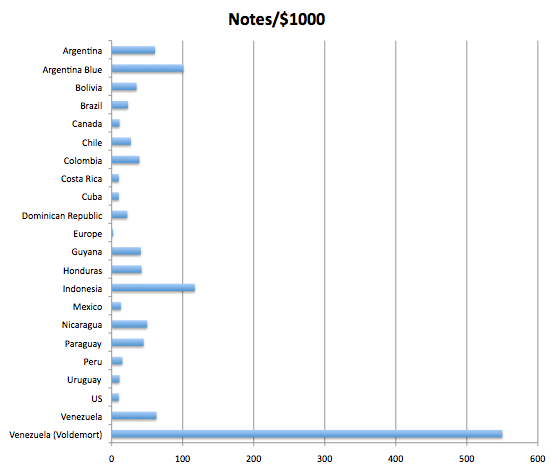 You need 10 US$100 bills. That will fit easily into a typical wallet. Things are easier in Europe, where you need only two €500 bills. Some other countries, not so much. How many notes do you need to have $1000? 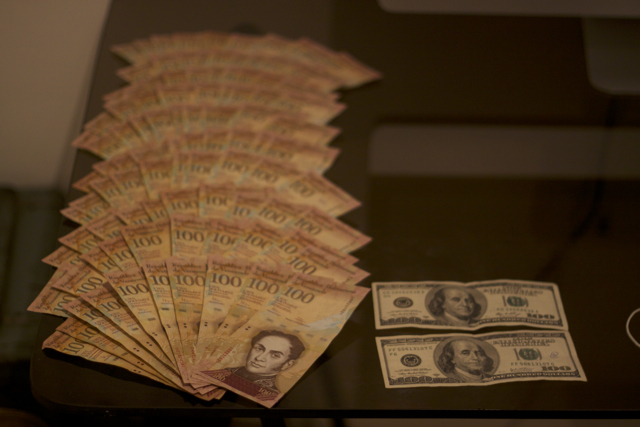 The Venezuelan 100-bolivar note is the country’s highest-denomination currency. When introduced in 2008, it was worth US$46.51. Valued at the price that people will pay for it (rather than the “price” declared by the government) its value has now slipped to $1.88, making it the least valuable top-denomination currency in any country in the Americas, at least. In real terms, you need 550 of them to have $1000. Are there others like it elsewhere? This entry was posted in Uncategorized and tagged chart, currency, us, venezuela on November 20, 2013 by Steven Bodzin. The judge sentenced Caldera to imprisonment at the police station … of Barinas…. On Tuesday, October 30, 2013, the PDVSA engineer may have solicited the amount of 18,000 bolivars from a representative of Hidrolab Toro Consultores CA in order to approve a security performance evaluation. …The company complained to the Servicio Bolivariano de Inteligencia Nacional (Sebin). This engineer was detained for demanding a bribe of US$327.27. Or to put it in upper middle class purchasing power terms, that would buy the engineer a nice steak dinner out for a family of four (3,000), a large Christmas tree (3,000), an off-brand polo shirt (1,100), a Samsung Galaxy S I9000 (3,500) and a new bumper for a Toyota 4×4 (8,000). Or in even simpler terms: less than the price of a new IPhone 4S. So please remember that, PDVSA workers. You can’t go demanding bribes. You need to wait for the vendor to suggest it to you. * Yes, Dolar Today is being blocked by all ISPs, as is the Twitter link-shortener bit.ly. as the brainiac Cuban, Iranian or Chinese people running the country’s censorship program don’t realize that Dolar Today uses goo.gl and that blocking bit.ly just cuts people off from everything else. This entry was posted in Uncategorized and tagged corruption, law, pdvsa, venezuela on November 20, 2013 by Steven Bodzin.